The Gamma Live Wire Professional 1.32mm tennis string set is 12.2m (40ft) long and features an advanced string construction with 50% more Iso-elastic fibres, NCP Tension fibres ensuring longer tension maintenance, as well as new PEEK abrasion resistant fibres which are woven within the outer wraps to provide enhanced durability. The string set offers the Live Wire Multifilament technology and guarantees gut-like performance. It ensures a crisp, solid feel ideal for professionals and has a gauge of 16 (1.32mm). for submitting product information about Gamma Live Wire Professional 1.32mm Tennis String Set We aim to answer all questions within 2-3 days. 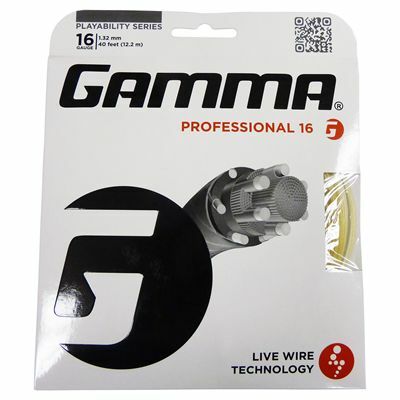 for submitting product information about Gamma Live Wire Professional 1.32mm Tennis String Set. We aim to answer all questions within 2-3 days. If you provided your name and email address, we will email you as soon as the answer is published. for submitting product review about Gamma Live Wire Professional 1.32mm Tennis String Set.